Unfortunately not all of the letters that are delivered are opened. If a mailpiece gets binned before it is opened your efforts would have been in vain. If they think a letter is junk mail or just doesn't create a hook to entice the householder to open and read your message then that's one less customer. Capturing your potential customers attention and competing with all the other mail delivered to the home is one part of the equation that makes up a successful marketing campaign. Digital envelope printing is a great way for you to grab attention with a message printed directly onto the envelope. Your message can be visuals, text or a mixture of both. You can have plain envelopes digitally printed or have them overprinted to fit your existing pre-printed envelopes. Personalised envelope images and text that uniquely targets individual customers can be created from your database. For example, if you were a travel agent and your database holds a list of customers who booked holidays with you the previous year you could send them an eye catching mailing. Your database could hold information about the type of holiday your customers enjoy such as tropical beaches, winter ski or cruises. 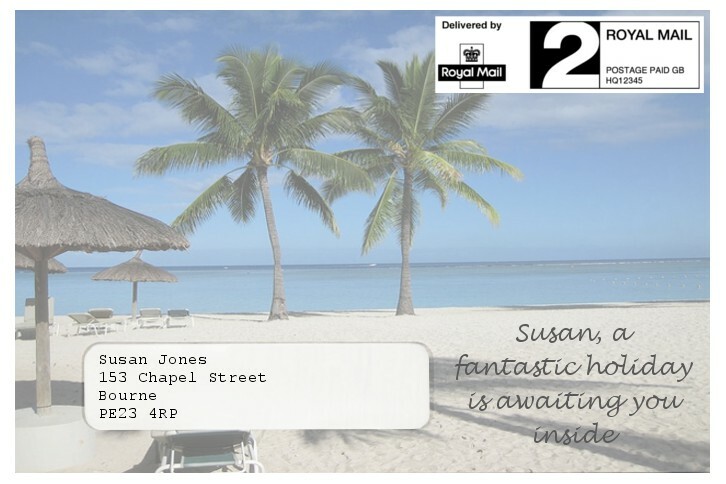 From this information we can print holiday images suited to individual customers from yours or our image artwork. Personalisation can be used to create an inviting greeting on the outside of the envelope to invite the customer to open the mailing to find out more.